Jermaine Dupri is an American record producer, songwriter and rapper. Before continuing his artistic career, Dupri opened a small store, "Rap Corna Guuds". He later formed the teen duo Kris Kross (Chris Kelly and Chris Smith) after meeting the boys at a local mall in 1991. The group's first album, Totally Krossed Out, was released in 1992 and went multi-platinum due to their singles "Jump" and "It's a Shame". He established his own record label called So So Def Recordings in 1993. Shortly after he discovered female R&B group Xscape at a festival in Atlanta and signed them to the newly minted label. Hummin' Comin' at 'Cha and went platinum. During the same year, on Yo! MTV Raps he met Chicago rapper Shawntae Harris, A.K.A Da Brat through Kris Kross, signed her to his label So So Def Recordings, and released her debut Funkdafied (1994) and went Platinum 1,000,000 units. His finances were not hindered by a distribution deal made with Columbia Records in 1993. 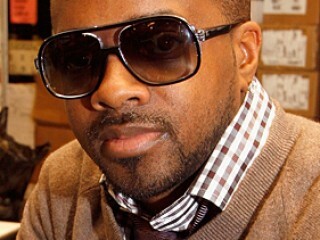 View the full website biography of Jermaine Dupri.